By the 15th day in the study, those taking Tylenol reported significantly less hurt feelings than those taking placebo, an effect that grew stronger each day to the end of the study. Just as Tylenol dampens sensitivity to pain, it seems to raise the ‘pain’ threshold for hurt feelings. This finding was extended by another, separate study. When chronically anxious people took Tylenol, amazingly it began to lift their feelings of social self-esteem.#4 One can only speculate that it reduced their sensitivity to the cuts inflicted by social pain, making them feel better about themselves. If these studies can be independently replicated, the implications are far reaching. Pain is a biological, alert signal essential for the survival of the species. While a few humans (through injury or congenital abnormality) never experience pain, they only survive in a perpetual state of mortal danger. Imagine resting your hand on something dangerously hot with no signal to tell you that your flesh is disintegrating. Pain alerts us when something physical is not right. A number of emotions also, alert us when something mentally is not right. When relationships or interactions fail to go as we want, we feel irritation, frustration, disappointment, sadness and hurt. But aren’t they all just emotions? By alerting the mind when something physical is not right, pain stimulates the necessary attention. Many emotions (like frustration, irritation, disappointment, etc) are likewise reactions to mental things not going right. They also serve to focus attention on the source. It seems a radical idea that the signal from mental things ‘going wrong’ is related to the signal for physical things going wrong. But the idea is not new. Gray (1987) was the first to argue for a kind of neurological overlap.#5 He suggested that the unexpected loss of, or failure to obtain a desired reward promotes similar emotional experience as the presence of a threatening stimulus, including pain. According to Eisenberger and Lieberman (2004) the function of this brain region is to detect discrepancies, such as those between desired and actual conditions. It triggers an alarm or warning signal that disrupts attention to refocus us on the source of the threat.#7 However, this same brain area (ACC) is also activated when we experience these other emotions that are prompted by things that are unexpected. Even surprise activates it. Surprise is yet another response to discrepancy or mismatch and indeed, in some circles it is regarded as an emotion (albeit a more affectively neutral one). What emerges is a view of the ACC as the centre of a common, neural alarm system - not just for pain but also for discrepancy, inconsistency and uncertainty. There is accumulating evidence that evolution may have adapted this discrepancy-sensing mechanism from simply triggering pain to also serving these emotional alert signals like surprise, irritation, frustration etc. In other words, these seem to be built on top of, or evolved from the same mechanism. It may help to think about this as a signal-spectrum that ranges from feeling pain at one end to something affectively neutral at the other, like feeling ‘uncertainty or surprise’ (or even cognitive dissonance). In between are a number of emotions of varying intensity. When this signal indicates that all is not well physically, it is experienced as pain whereas at the other end, it is felt as cognitive discrepancy i.e. uncertainty, surprise or cognitive dissonance. Especially with interpersonal interactions, the signal is likely to be felt somewhere in the middle as emotional hurt. 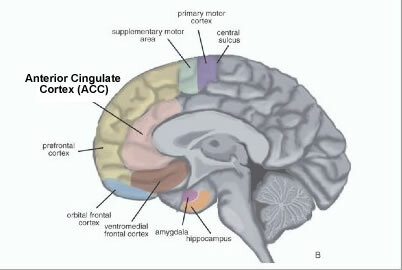 Download pdf copy of "Emotion is a Pain in the Anterior Cingulate"
4. DeWall, C. N., MacDonald, G.,Webster, G. D., Stillman, T. F., Tice, D. M., & Baumeister, R. F. (2008b). 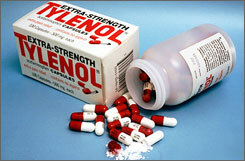 Can Tylenol boost self-esteem? Effects of acetaminophen on the link between perceived threat and social self-esteem. Unpublished manuscript. 5. Gray, J. A. (1987). The psychology of fear and stress. Cambridge, Cambridge University Press. 7. Eisenberger, N. I. and M. D. Lieberman (2004). "Why rejection hurts: A common neural alarm system for physical and social pain. Trends in Cognitive Sciences." Trends in Cognitive Sciences. 8: 294-300. 8. Even humor is one of those emotions that is related. I pointed out in False Alarm Theory -How Humorous Ads Work that when humor triggers attention, it does so via this same mechanism as threatening stimuli. But instead of the signal prompting ‘flight or fright’, its cancellation triggers another signal, laughter (a primitive false -alarm signal) and the relief (like scratching an itch) can be enjoyable.